The Myer Briggs test is probably the most well-known personality exams around the world that was created many years ago with little updates since it came to be. It was invented by two women, Katharine Cook Briggs and her daughter Isabel Briggs Myers, who were two naturally curious individuals that wanted to learn and study human behavior. With there innovate test, they were able to create a system that became respected around the world in determining the mindset of a potential candidate for a company. This may seem very revolutionary. But is it still relevant today? Is it even accurate? 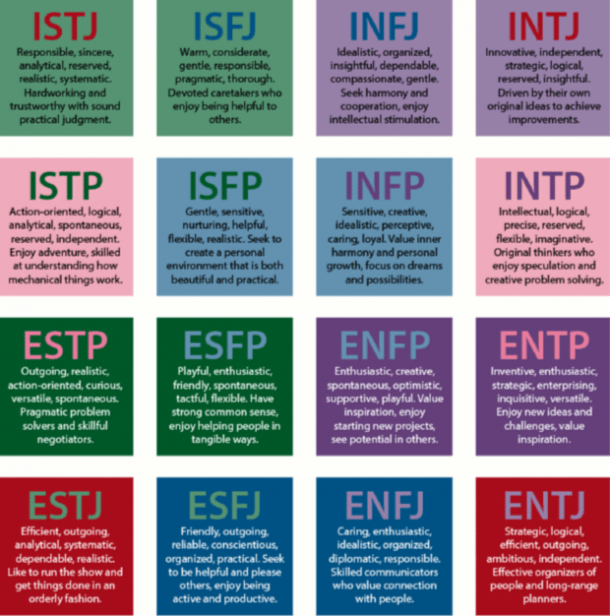 Since the Myers-Briggs Type Indicator® (MBTI®) was created, society has changed so much and we have access to much more technology than Myers and Briggs did. With the changes in technologies, such as cell phones and the Internet, it's hard to categorize any individual's personality because of the many types of social interaction possibilities that did not exist in the 1940s . According to an article written by psychologist Dr. Adam Grant, he suggests that in order for scientific tests to be valid, you must be able to achieve the same results multiple times. In a recent study done by Annie Murphy Paul, she suggests that more than three-quarters of test takers achieved a different personality type when taken again. Many companies have used this test on potential hires during interview processes because they want to see if the candidate is a "natural leader." However, this use of measurement is inaccurate due to the different outcomes that someone can have when taking this test more than once. Categorizing people based on whether they are extroverted or introverted, factual or intuitive, thinking or feeling, and judging or perceiving, is too simplistic. Everyone has different social cues of interaction depending on the situation. For example, when your friends ask you to go to the club with them, something you do not enjoy or feel like doing, you are inclined to say no. However, when it comes to a company party or meeting up with your crush, you would be more likely to say yes. With the new age of technology and social media, it can be hard to define a person's personality. We have the ability to hide behind a glass screen and a sense of protection and confidence comes with it. In a study done by Amy Gonzales, an assistant professor who studies social media and health at the University's Medical School, found that college students who viewed their own Facebook profiles enjoyed a boost in confidence afterward due to posting images of the best versions of themselves. Social media has become a way for individuals who are less introverted to become extroverted. With the option to create online aliases, people are more likely to post whatever they want in-person with the consequences of human, emotional responses. People love taking tests that define them and lump them into categories based on a specific set of questions. This type of mindset starts as early as elementary school. Whether it be sitting in classes with individuals that scored the same test score on your standardized test or deciding where to sit at the lunch table to see what click you belong to, people like to know where they stand in the world. With personality tests like this one, it should not be taken seriously in defining what type of person you are. This exam should be a fun activity you do with your friends and family, not a determining factor in professional settings.